New 24-inch and 44-inch large-format inkjet printers from Epson with wide-gamut announced. Epson printers and projectors have been used for the Royal Academy Schools postgraduate exhibition. Epson has delivered new large format printers to the University of Huddersfield. HP has extended its photo printing leadership at photokina 2012 with new solutions for retailers. Create professional photos & fine art prints with high colour accuracy. 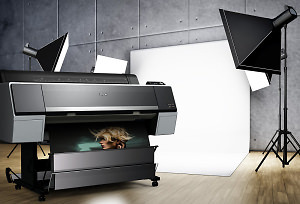 New 17-inch printer offers professional photographers a super-wide colour gamut with automated colour accuracy . DCP Systems report twice the number of orders for large format printers at Focus. Epson printer used to produce Smart-Arts exhibition. The PIXMA Pro9000 Mark II takes advantage of Canon’s rich imaging heritage. Fujifilm GreenBox 7900 is a complete solution for anyone ready to move up to the latest standard in image quality and productivity. The latest products help photographers capitalise on new revenue opportunities from digital print.